Whether you’re binge-watching Orange Is the New Black or watching Winter Soldier for the umpteenth time, it’s all better on a bigger screen. Which is exactly why we’re giving one lucky winner Samsung’s 50-inch 4K LED TV—plus, a Roku 3, Apple TV, or Amazon Fire. Want a chance to win? Head over to The Mary Sue Shop! Entering is beyond easy—just enter your email address. And if you want to up your odds of winning, share the giveaway with friends—the more people enter the giveaway using your referral link, the more extra entries you’ll get for yourself. If you’re the Chosen One, you’ll get the huge Samsung 4K LED TV, complete with built-in Smart TV and SmartView 2.0 for easy mobile video streaming. Plus, have your pick of streaming accessories—the Roku 3, a powerful streaming player with access to over two thousand channels; the Apple TV, which lets you stream videos, access music and photos from your iCloud, and use AirPlay to stream from your devices; and the Amazon Fire TV, a streaming media player that also has over a thousand games and apps. What are you waiting for? 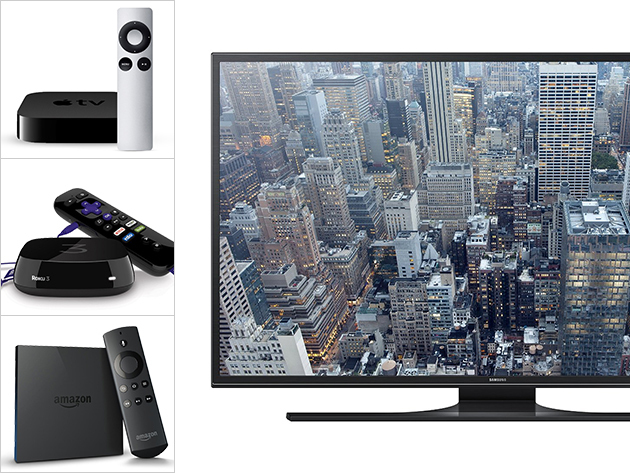 Win big with our Samsung 50-inch TV and streaming player giveaway now at The Mary Sue Shop.